Hailing from a small group of islands in the South Pacific, crested geckos (Rhacodactylus ciliatus) are small, nocturnal, tree-dwelling lizards. Very well suited to captivity, crested geckos thrive eating an entirely commercial diet, and do not require supplemental insects. However, they remain aggressive predators of potential prey, which includes virtually any creature small enough to consume. You can keep crested geckos in small groups, but do not house males together, as they are likely to fight. Pairs or trios consisting of one male and two females usually live together harmoniously. 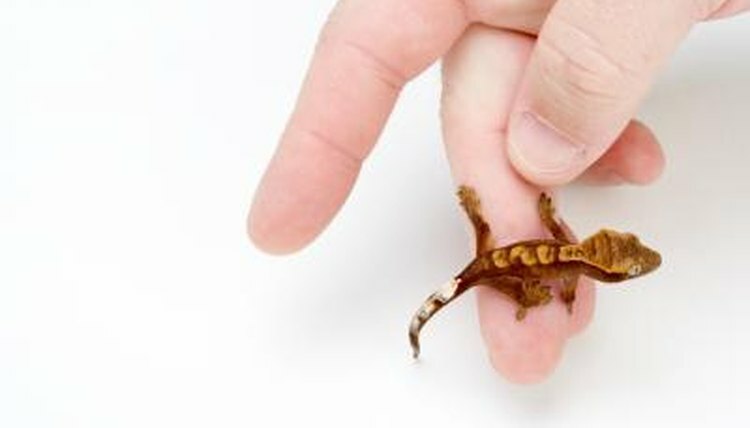 Adult crested geckos may view hatchlings or juveniles as potential prey, and attempt to eat them. Even if the adult is not able to consume the smaller lizard, he will likely kill her in the process of trying. To avoid this possibility entirely, only house similarly-sized geckos in the same cage.